On the eve of the Task Force on Justice Partner Forum, we cordially invite you to participate in the launch event and actively contribute to the dialogue on the engagement between formal and customary and informal justice systems. Invited justice leaders from Kenya and Kyrgyzstan will share national experiences and insights on ongoing reforms, complementing formal courts and curbing practices breaching human rights while contributing to political stabilization efforts. Customary and informal justice systems are an integral pathway to justice, indispensable to the realization of access to justice for all as reflected in Agenda 2030 and Sustainable Development Goal (SDG) 16. While precise data is difficult to discern, recurring estimates suggest 80 to 90 per cent of legal disputes in developing, fragile and post-conflict states are resolved using customary and informal justice systems. Users of these systems are disproportionately women and vulnerable groups - the poor and remote, marginalized, and minority populations. Light refreshments will be served after the discussion. We cordially invite you to participate in the launch event and actively contribute to the dialogue. To confirm your attendance, email thehague(a)idlo.int before Friday February 1, 2019. 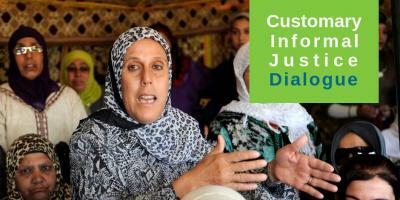 Twitter: Follow @IDLO and contribute to #InformalJustice. Facebook: Watch the event with Facebook Live here. There will be intermitted broadcasting from 15:00 CET. The event will have filming/photograph for social media and future promotional and archive purposes. Please contact an IDLO staff member at the event if you would prefer not to be filmed / photographer, or contact communications(a)idlo.int. **The two publications will be available for download on www.idlo.int on the day of launch, February 4, 2019.